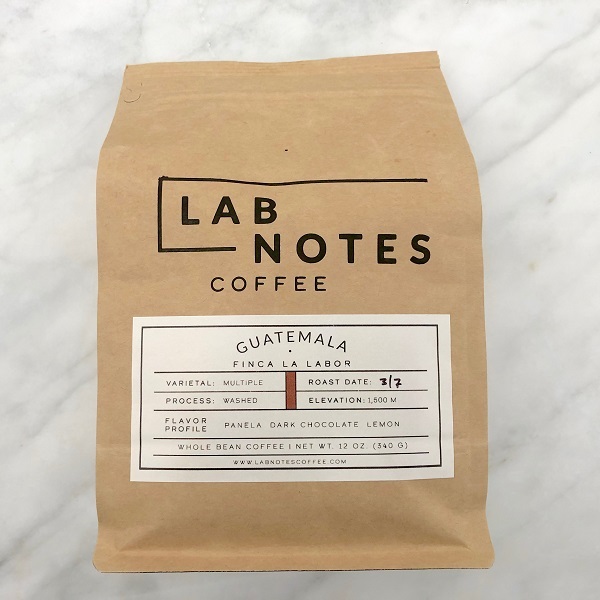 This single origin coffee comes from Lab Notes Coffee in Mesa, Arizona. They’re a micro-roaster coffee company, that was started last year by a husband and wife team. They offer a handful on quality coffees and are a great representation of the type of craft roasters we love to promote. The interesting note about these beans is they’re actually grown inside the city limits of Guatemala City. They’re three varietals of beans, bourbon, typica & catuai, which is very common to find these three together. As an espresso it really shined as a single origin, the flavors of chocolate and lemon. It had nice crema and smooth and balanced flavors through-out the espresso shot. As a pour over coffee it didn’t carry through with the same quality of flavors we tasted in the espresso. It’s a medium to dark roast coffee that was smooth, and well balanced. The pour over coffee would appeal to most coffee drinkers, however the richness and flavors of the coffee lacked a little. Special thanks to Luke from Lab Notes for the coffee, visit them at https://www.labnotescoffee.com/.